A prophet. What do you think of when you hear those words? Perhaps you think of a prophet from Old Testament times, wearing a long robe. Or a Book of Mormon prophet holding the Liahona. Perhaps your prophet is old, like Moses. Or did you imagine a young boy prophet like Josiah? Maybe you thought of today’s prophet, who wears a suit and tie. More important than a prophet’s clothing, age, or other physical appearance is that every prophet is called of God by prophecy (see A of F 1:5) and that he speaks for the Lord (see D&C 1:38). A prophet is the Lord’s representative on earth, and he gives counsel about how we should live. When we obey the Lord’s counsel, He will bless us. The prophet does speak for the Savior. We can follow Him in faith by listening to and obeying the counsel of the prophet today. When we heed his words, we are better members of The Church of Jesus Christ of Latter-day Saints. Mount page 20 on heavy paper. Cut out the figures of the Savior, the prophet, and the children, then fold down the center and glue the backs of each one. Cut out the path along the broken line; carefully cut the slits at A, B, C, and D. Then use the point of a pencil to make a small hole at the dot in the center. Insert the tabs in the corresponding slits. Make a knot in one end of a string, thread the unknotted end up through the hole until it stops at the knot, then hang your mobile where it will remind you of your desire to follow the prophet. 1. 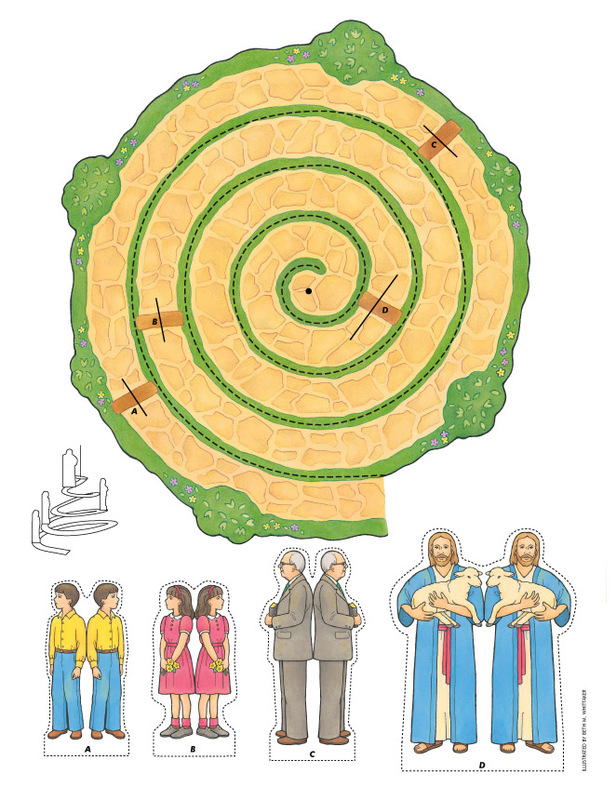 Help the children review some of the principles taught in the most recent general conference by referring to the Sermon on the Mount. Write selected beatitudes (Matt. 5:3–11) on the chalkboard. Choose conference messages that have similar themes. Have the children take turns reading a section of a conference talk﻿—or have an adult read and/or paraphrase one﻿—then locating a beatitude with a similar message. Choose additional conference talks that would help your Primary children. Divide the Primary into groups, and give each group a section of a talk to read. Have the group write, in the form of a beatitude, a blessing they can receive for obeying a principle in the talk. (E.g., “Blessed are those who pay tithing, for the windows of heaven will be open to them.”) Have the children take turns reading their blessings. Sing songs that reinforce the principles being taught. 2. Help the children learn Article of Faith 1:5. Write each third of it on a different-colored paper. Cut the words apart. On one wall, randomly attach the words on the paper of one color. Repeat with the other two colors on two other walls. With the help of the music leader, make a list of songs the children know about prophets, such as “Follow the Prophet” (pp. 110–11), “Book of Mormon Stories” (pp. 118–19), “Keep the Commandments” (pp. 146–47), “Latter-day Prophets” (p. 134), “Stand for the Right” (p. 159), “Nephi’s Courage” (pp. 120–21). Read Article of Faith 1:5 out loud together. Place one piece of each color of paper in a container, divide the children into three groups, and have each group choose a paper to determine which third of Article of Faith 1:5 it is to rearrange. Have the groups take turns answering questions about prophets. If the answer is correct, the child may switch any two words in his group’s section to try to put the words in order. Alternatively, a child may choose a song for his or her group to sing. While the song is being sung, the child rearranges as many words as possible in his group’s section. When a group has the words in the correct order, have them stand and read it aloud. Allow the other groups to complete their sections. While the Primary sings “The Fifth Article of Faith” (p. 125), have some children mix up the words within each color again. Assign each group a new color and repeat the process of asking questions and rearranging words to help the children learn all three sections of Article of Faith 1:5. Bear testimony that the prophet has been called of God. Express gratitude for the priesthood with its power and authority being restored in the latter days. 3. For older children: Help the children review messages given during general conference by using the video Sharing Time with President Gordon B. Hinckley (item #53331). Discuss the lessons President Hinckley teaches in this message. Discuss some of the visual elements that were used to help illustrate the points: pictures of a child being baptized, a scene of a child paying tithing, etc. Give each child a piece of paper and some crayons. Divide the children into groups, and give each group a talk to illustrate. Choose general conference talks with principles the Primary children could live more faithfully. Have a leader or older child read selected sections from the talk to the group, then ask, “If you were making a video, how would you illustrate the message or show ways children can live the principle taught in the message?” Have each child in the group choose a different picture to draw. Tape the completed pictures together in a continuous roll to illustrate the talk. Use a roller box (see TNGC, 178) to present the pictures to the rest of the Primary. Have the groups take turns reading their assigned conference message and showing the illustrations with the roller box. Display the illustrated conference talks and have the children invite family members to view their pictures and retell the message. 4. Song Presentation: Help the children learn “The Things I Do” (pp. 170–71) by using questions to direct their listening and by having them draw illustrations on the chalkboard. Invite the children to listen while you sing the first phrase to discover why Primary children don’t go abroad to teach and preach the word of God. Have the child who answers correctly draw on the chalkboard a picture that helps illustrate that phrase while the rest of the children sing it with you. Invite the children to listen while you sing the second phrase to discover how they can show that they know that the word of God is true. Repeat the process of having a child draw while the others sing the phrase. Have the children clap or tap the short-long-short-long rhythm of the first verse while they sing it. This rhythm is used for verses 1, 2, and the first part of verse 4. Repeat the process of asking questions, drawing pictures, and tapping the rhythm for the second verse. Before beginning verse 3, have the children tap the straight count beat. While they listen to the words and draw pictures, ask them to think about the reason the composer chose to make verse 3 a different rhythm. Discuss how verse 3 talks about being in church. Perhaps the rhythm of verses 1, 2, and 4 feel like skipping, which would not be appropriate at church. Instead, children walk to show their reverence because church is a sacred place. Continue with teaching verse 4 by asking questions, drawing pictures, and tapping the rhythm. Bear testimony of the great influence that children have when they set good examples and do things that show that they know the Church is true. Express gratitude for the teachings of the prophets, who help all members of the Church know what to do. 5. Additional Friend resources: “Be a Standard-Bearer,” June 2001, 24–25; “A Prophet’s Counsel,” May 2001, 2–4; Sharing Time, Jan. 2001, 14–16; Sharing Time, Jan. 1998, 12–13, 45. Ensign resources: “His Word Ye Shall Receive,” May 2001, 65–67; “Prophets and Spiritual Mole Crickets,” Nov. 1999, 16–18; “Beware of False Prophets and False Teachers,” Nov. 1999, 62–64.